A fast, fun and freaky deck building game. The Penny Arcade Game: Gamers vs. 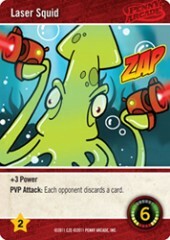 Evil brings 13 years of fun and irreverence from the grey matter of Jerry Holkins and Mike Krahulik into a fast, fun and freaky deck building game. Please be aware this card game might not be suitable for all gamers. Penny Arcade is the longest running most successful gaming web-comic series in history. This god-like, blinding success didn’t frighten the folks at Cryptozoic Entertainment who as fans themselves, envisioned a Penny Arcade deck building game that would cause whole sections of the population to put down their controllers, push aside their tablets and games of “Draw Something,” drop their polyhedrons and start shuffling – consequently lining the company’s pockets with gold! It is with a heavy heart that we divulge the game’s secrets to the general population – risking further blinding success. Players use these two resources to purchase the two major types of cards in the game: use Tokens to purchase Green (Gamer) cards, and Power to purchase Red (Evil) cards. Balancing your resources then becomes more challenging as you decide to spend and acquire more Power, or Tokens to realize your ultimate destiny in being a Gamer, or turning Evil thus embarrassing the other players with wanton destruction! By the way, you don’t get only one “buy” during your turn in this game. Oh no, you can divide all your Tokens and/or Power on any number of cards you want. In other words, if you reveal 6 Power in your hand, you can buy 3 cards that cost 2 Power each, or 1 card that costs 6. Follow my math there? The Boss Stacks (One Gamer one Evil, of course) are set up at the beginning of the game, and are made up of a Level 1 Boss card, (say… Dark Tycho for example) 4 random face-down Loot cards, then a Level 2 Boss (Even Darker Tycho?) 4 more random face-down loot cards and on the bottom a Level 3 Boss. 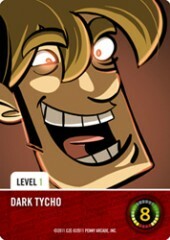 (Ultimate Dark Tycho!) The Loot cards are worth a lot of Victory points, and in addition have some pretty powerful affects. Evil Boss Loots for example, give a player lots of Power and attacks effects ( as Evil has a tendency to do). Gamer Boss Loots offer a fun game mechanic that when played allow the player to roll a d20 – with mostly fun positive Gamer-type effects. The cost of the Loot cards increase as the level of the Boss increases. Once either Level 3 boss is bought – game over. Players count their Victory Points and then either cry out “Kaaaaaaaahn! !” or raise their arms in primordial triumph! Booyah! The original artwork on the box cover is wicked. It shouts; “buy me!” and “play me!” The cards are of reasonable quality all the artwork is great. Overall the layout is perfect – colorful and fun. The only gripe I have is with the d20 included in the game. I mean… it just didn’t roll the right numbers. Sure, for my opponents it worked great, but for me, nothing. That’s not cool! I really think the die is defective or something. Argh! It’s not really a curve, more of a learning… line? Anyone can learn this game… and easily. You know? That’s it, really…anyone. It’s a line. Nuh uh. The subject matter makes this unsuitable for typical families. BUT families whose children are over the age of 15 and have geek-like tendencies may have a great time. It’s a parental call. It’s only a 4-player game but the card play really does have a party atmosphere. It may fit into a night of social gaming – if you call 4 people “social” which some game geeks might. The game does offer a test of resource balancing and multiple strategic options, but not enough to create a compelling test for the true strategy gamer. Yup, fun, fast, you wanna play again. Perfect for the casual gamer who wants little investment and maximum reward in a game. Kind of like eating sliders! Sure… Avid gamers will want to try this game for its unique mechanics and as a light, fun filler. It’s also a great way to trick… I mean introduce your friends to the world of deck-building games and Penny Arcade. This game is probably not complex enough to offer a challenge to the Power Gamer. In fact it kind of makes fun of power gamers… so really… just don’t look. Any game built around a successful license has a lot to live up to. It has to meet the expectations of the folks who know the license inside and out, who are seeking out the game to enjoy its characters and share in its coolness. In most cases, games that have major licensed themes are targeted to fans of that brand. (i.e. 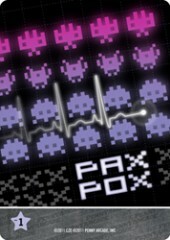 – I Like Penny Arcade so I will like this game.) So one would think that if a person wasn’t familiar the characters and world of Penny Arcade, there would be a huge disconnect with the property and the game experience would suffer. Not so. In fact, the variance on familiar DBG mechanics made the game extremely enjoyable and coupled with the sheer absurdity of the characters in the game, this created the urge to find out more about this geek leviathan that is Penny Arcade. That’s a testament to designer Paul Sottosanti in creating a successful blend of accessible game play for non Penny Arcade fans, with famous characters and situations for the actual fans of the property. There is not one sentence of “flavor text” on any of the cards. Where in some licensed games the characters would call for a bit of explanation to make it appealing to those who aren’t familiar with the brand or fun quotes for the fans, Crypto left it out, creating even more interest in the brand. Yes, there are some less than appropriate aspects of the game, but Penny Arcade is not for youth or the easily offended. Never has been. The game is a blast. And with the recently released expansion: Penny Arcade: The Game, Rumble in R’lyeh – it’s sure to have some longevity in our less-than-conventional hobby. Welcome to the world of Penny Arcade, the top web comic for all things gaming whether it's video games or tabletop. So, it's only fitting that Penny Arcade get its own deckbuilding game. Players will select cards from a communal pool. You've followed the way of the warrior, the story of the Cardboard Tube Samurai. You've sent your dollar-a-day to support Baby Ninja with smoke bombs and magic scrolls . Now rally them together to build your perfect deck. Players select a hero card. Pick from Gabe, Tycho, and others straight from the Penny Arcade comic. Purchase Gamer cards with your gold. Yes, put that Merch in your deck! CONSUME! If you'd prefer to battle, wield the Cardboard Tube and attack one of the Evil cards. Dodge PAX Pox, make friends with a Werewolf With a Top Hat, ally with Cardboard Tube Samurai, PvP with your opponents, and skewer Dark Tycho for his epic loot. Build your perfect deck and win the battle of Gamers vs. Evil. Cory Jones shows what's inside the Penny Arcade deck building game. New to deck building games or Penny Arcade The Game: Gamers vs. Evil? We'll show you how to set it up and how to play our game. Watch our Cryptozoic staff battle in an epic match of the Penny Arcade deck building game..
All in all it is another deck building game. There are some unique aspects of the game but nothing that no other deck building game has tried. There are two different resources, each character has a special ability, some cards attack other players, etc. Strategies are much like any other deckbuilder. Buy better cards, get cards to get rid of worse cards, eventually you can start buying boss loot then the game ends. The one thing that sets it apart from other deckbuilders is the humor. It has references to funny comics on cards with funny names that often have funny pictures. You can all laugh together as everyone yells “Touch Wieners!” together and reveals the card. Dominion can be very, very dry with cards like “Market” and “Moat.” This offers some of the complexity of a Deckbuilder while ensuring everyone is having a fun time. This is a deck building game in the style of “Market based” there are piles of pre-choosen cards 6 out of 12 and you can purchase as many as you can afford per turn. Which you then instantly discard to build up your deck. This game is very silly and is played best when you have a group of people that can really enjoy the absurd aspect of playing a game where you can touch wieners :D.
The mechanics are all pretty simple but can definitely play into some rather complex turns as the game progresses. I feel like the green cards generally feel slightly under powered as you really require red cards to win the game in the end. Overall though I really love penny arcade and as a first deckbuilding game this is very accessible to people less familiar with some of the more complicated mechanics of card games. 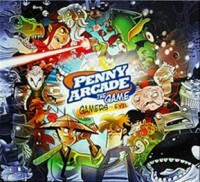 Add a Review for "Penny Arcade: The Game, Gamers vs. Evil"